Read a recent review of the TUT series! Despite its subtitle, this volume is very popular with all players and hobbyists, from on-stage music pros to basement tinkerers. And there's quite a lot of information here, so get your coffee before you read the description below! TUT2 builds upon the formidable knowledge base of TUT, adding new depth to previously explored topics while introducing completely new subjects. Harmony within the player is emphasized as the foundation of harmony within a band and on stage. The role of the sound man is explored with an eye to the evolution of PA and monitoring systems. Modular monitoring systems and local vocal PAs are also examined, allowing the singer to explore the use of tube equipment and effects. 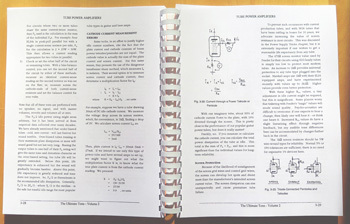 The extensive "Power Supply Tricks" chapter explores concepts of power. Transformers, rectifiers, capacitive and choke filters are studied, and the issues of regulation are detailed. Inherent regulation of transformers and active tube, mosfet and bipolar regulators are discussed. Variable, tracking, fixed and proportional regulators are explained, along with the consequences of their use in "live" situations, comparing AC and DC controlled circuitry. Variacs, boost/buck transformer connections, zener diode and variable impedance rectification are presented, with their impact on performance and tone. This volume illustrates and explains bias supplies of all types. The three common bias procedures are thoroughly discussed with all relevant issues exposed and diffused. Bias "fixes" for many popular amplifier models are provided. 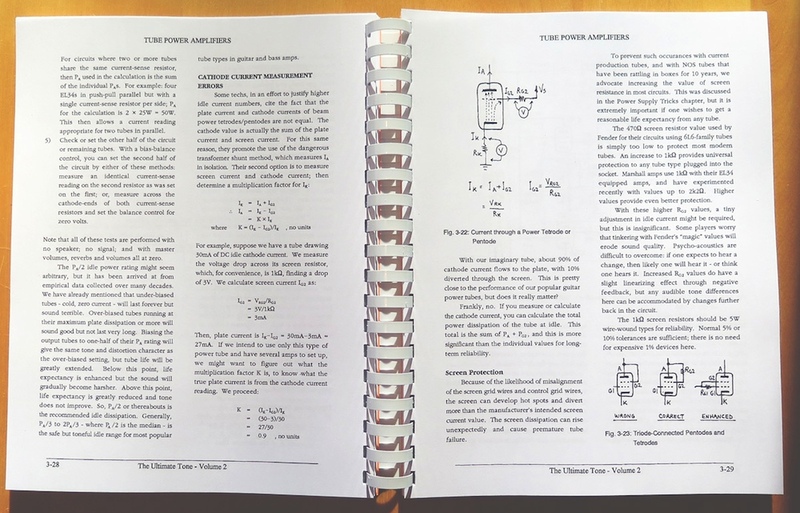 The book highlights the importance of screen supplies and stand-bys, and a variety of DC heater circuits are presented to bring to light both old and new ideas. Where the first volume of TUT approached tube power amplifiers assuming that the reader already had one and wanted to understand its operation and modify it, TUT2 is aimed at those who want to build an amp from scratch. Design rules are given for the five output stage topologies, with pointers regarding power output and tone. Cathode-bias to fixed-bias switching options are presented, along with less well-known power amp master volume circuits. TUT2 also discusses opening up feedback loops, single-ended to push-pull panning, and solutions to "re-issue" amp model problems. Many players use solid-state power amps in both elaborate and simple instrument systems. The design of these amps is presented in a simplified fashion to highlight the ease of their assembly, the range of their tone and the almost limitless circuit options including: push-pull, mosfet, BJT, SRPP, cascode, multi-tier, bridges (grounded-floating-balanced), and non-feedback. Reliability is emphasized without detriment to tone. Thermal design and the solid-state power amplifier's intimate relationship to the power supply are clearly explained. Design examples from 20W to 1,250W are given. Hybrid power amplifiers incorporating both tube and solid-state elements provide options of tone, size and economy. The Nelson Pass Zen amp and John Linsley-Hood's simple class-A amp are presented along with alternative amps such as the circlotron, OTL and SRPP. Also covered are true triodes, which are becoming popular in both single-ended and push-pull formats. Triode and pentode gain stages are explored, with the use of power tubes and large-geometry tube types for voltage amplification. High-gain preamps, split-rail designs, passive EQ and frequency shaping are discussed. Multi-band EQ with active tube stages and tube cross-over units are highlighted. Mono and stereo reverb using tubes are integrated into the music system. Various tremolo circuits with bias- and audio-modulators are given; compressor circuits using both tube and solid-state approaches are offered in low-distortion balanced and toneful unbalanced formats. Line and direct outs are also highlighted. Speaker selection, design and enhancement are explained. Acoustic instrument considerations are exposed and simplified, as are the specific adaptations for tube vocal preamps and monitor systems, and the evolution of tubed bass amplification. Simple switching techniques are given for both low-level and speaker control, demonstrating the capabilities of modern devices. Sounds like a lot of information? Well, we often described TUT as "the tip of the iceberg" of state-of-the-art tube amp understanding, and TUT2 is another "big chunk" of knowledge! Many of the "Glass Shards" tips in Glass Audio magazine have come from TUT2.